Posted on 5, December 2018 by EuropaWire PR Editors | This entry was posted in European Union, France, Internet & Online, Science, Technology and tagged Atos, Bezons, EU, h2020, mathematicians, quantum, Quantum Flagship, quantum physicists, quantum technologies, Thierry Breton. Bookmark the permalink. 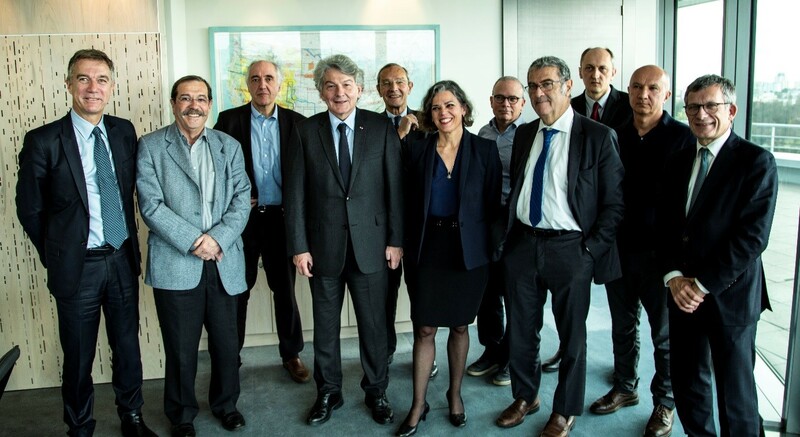 Atos Chairman and CEO Thierry Breton surrounded by the Atos Quantum Scientific Council members on December 4 : Nobel prize laureate in Physics Serge Haroche, Daniel Estève, Alain Aspect, David DiVincenzo, Artur Ekert, Fields Medal laureate Cédric Villani (Council member excused) and the members of the managing team of Atos Quantum. PARIS, 05-Dec-2018 — /EuropaWire/ — Atos, a global leader in digital transformation, today holds its 5th Atos Quantum Scientific Council meeting in Bezons. The members of the Scientific Council made of universally recognized quantum physicists and mathematicians reviewed the two research and development projects selected for the „Quantum Flagship“ – a one-billion-euro EU-funded initiative to develop quantum technologies – and acknowledged the European leadership of Atos in the quantum field. The AQTION project – Advanced quantum computing with trapped ions – aims at realizing a fully-automated ion-trap quantum computer to solve scientific and commercially interesting problems beyond the capabilities of classical computers. Atos will bring to the project its powerful programming platform, the Atos Quantum Learning Machine and work on finding new industrial quantum applications. The project led by the University of Innsbruck in consortium with other major academia and industry players, supports Atos’ commitment to develop a true 50-qubit quantum accelerator before 5 years. The PASQuanS project – Programmable Atomic Large-Scale Quantum Simulation – intends to create the well-advanced neutral atom and ion-based quantum simulation platforms up to 500 atoms, far beyond both the state-of-the-art and the reach of classical computation. Within this project led by Max Planck Institute of Munich and Institut D’Optique Graduate School, Atos is in charge of the application part with key European industrial partners like Total, Bosch, Airbus, French EdF, and Siemens. “Having two of our Quantum projects selected by the „Quantum Flagship Initiative“ launched by the European Union is a great achievement and establishes Atos as a leader in quantum computing. Our teams of researchers – supported by a world-renowned Scientific Council – have developed the most powerful quantum simulator on the market, which is now adopted by the world’s most prestigious universities and centres. Thanks to our global R&D laboratory dedicated to quantum computing, we are fully committed to make Atos and Europe leaders in this already major technology“.